A mere month after Swiss luxury watchmaker Hublot opened its first Las Vegas store at The Forum Shops at Caesars, the brand brought a second boutique to the Entertainment Capital of the World. Located at The Shops at Crystals, the new store’s opening – much like the inauguration of Hublot’s first Las Vegas address – coincided with a much anticipated boxing match. On Sept. 16, a day prior to the boutique’s launch, Hublot brand ambassador Gennady “GGG” Golovkin faced off Mexican boxer Canelo Alvarez at the T-Mobile Arena. During the fight that ended in a draw, Golovkin, who hails from Kazakhstan and is the current middleweight world champion in four disparate federations, sported shorts embossed with Hublot’s name. Later in the weekend, he attended the store’s debut, which unfolded with a ribbon-cutting ceremony and a tequila bar cocktail reception. Commemorating Mexico’s Independence Day as well as the fight, the boutique featured Mexican and Kazakh décor as well as Golovkin’s gloves, champion belts and robe. Save for the celebratory details, the design of the new store reflects a lavish modern aesthetic that comes with a private lounge and a full bar. The Crystals boutique will carry the limited-edition all black and black diamond Big Bang Las Vegas watches, which premiered last month exclusively on the Las Vegas market. 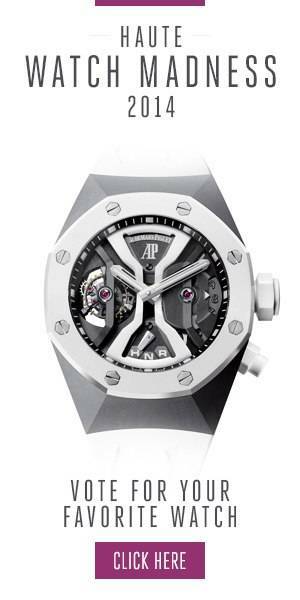 The collection of remarkable timepieces will also include the novel Classic Fusion 45mm Chronograph “Gennady Golovkin,” which made its debut at the event. Honoring the partnership between Hublot and Golovkin, the watch boasts Golovkin’s initials at 12 o’clock and his clashing-gloves logo at 3 o’clock. Fueled by a self-winding movement with 42 hours of power reserve, the timepiece rests on straps of black alligator leather and black rubber that flaunt yellow and blue stitching – a nod to Kazakhstan’s national-flag colors, which Golovkin wears on his uniform. The Classic Fusion 45mm Chronograph “Gennady Golovkin” is available in 100 pieces.